Before mortgage rates began their recent upward trajectory to start off 2018, quite a few mortgage refinances squeaked through the door. Some 446,295 refinances were completed by Fannie Mae and Freddie Mac in the fourth quarter of 2017, up considerably from 362,934 in the third quarter, according to the Federal Housing Finance Agency (FHFA). 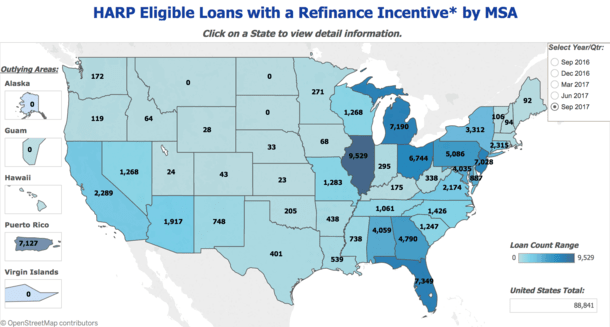 The FHFA’s Refinance Report for the fourth quarter also revealed that 6,309 loans were refinanced through the Home Affordable Refinance Program (HARP). With the latest quarter’s numbers now on the books, the total number of HARP refinances completed via the program since inception in 2009 stands at 3,484,025. It’s oh-so-close to 3.5 million, which even if it doesn’t get that high, would be seen as a very successful campaign to help underwater homeowners take advantage of lower mortgage interest rates. Speaking of getting to that number, there are still 88,841 borrowers who stand to benefit financially from a HARP refinance, per data from September 30th, 2017. Sure, mortgage rates have increased since then, but who knows what these near-90,000 borrowers are currently paying. Many borrowers who haven’t refinanced post-mortgage crisis still have fixed rates of 6% and up. The 30-year fixed is closer to 4.5% today as opposed to the very attractive 4% seen back in September, and there are fears it might move even higher in the interim. Of course, the opposite could happen as well given the big jump we experienced in such a short period of time. If a borrower is able to meet general HARP requirements and has the attributes mentioned above, a HARP refinance can be worthwhile. Those ~90k borrowers could save an average of $2,290 each year by refinancing their mortgage through HARP, which is roughly $190 per month. Not too shabby. So where are these remaining borrowers you ask? Well, most (70%) are concentrated in the states of Alabama, Florida, Georgia, Illinois, Maryland, Michigan, New Jersey, Ohio, Pennsylvania, and the territory of Puerto Rico. The metro of Chicago has the most eligible borrowers (8,131), followed by New York-Newark-Jersey City (5,308) and San Juan-Caguas-Guaynabo, PR (5,168). But nearly every state has homeowners who could benefit, aside from Alaska, Guam, Montana, the Dakotas, and the U.S. Virgin Islands. For the record, 26% of underwater borrowers who refinanced via HARP opted for 15-year and 20-year fixed mortgages, both of which accrue equity significantly faster than the more popular 30-year fixed. And those who refinanced their mortgages via HARP exhibited lower delinquency rates compared to homeowners eligible for HARP who didn’t refinance through the program. FYI, this is the final year for HARP before it’s replaced by the High LTV Streamlined Refinance program.